Pay only P 1,129 a Month for 12 months. Or pay only P 2,139 a Month for 6 months. Shuttle launches the new 8 series model-SH81R4 with excellent performance and strong expandability for diverse applications. The SH81R4 is based on an Intel® H81 Express Chipset and supports Intel® Haswell/Haswell Refresh 95W processors. Only 1/3 the size of a tower PC, the SH81R4 features extendibility and provides one PCI-E x16, one PCI-E x1, and two mini PCIe slots. Install dual-slot high-end graphics card, multi-display graphic cards, surveillance cards, RAID cards, mSATA SSD or WiFi modules and drive video wall, file server, network video recorder applications, and more. The SH81R4 is equipped with an 80 PLUS Bronze certified 300W power supply and Shuttle’s exclusive I.C.E. 2 heat pipe technology for highly energy-efficient and stable long-term operation. Shuttle XPC features stable, cool, and silent operation with Shuttle’s I.C.E. 2 heat pipe technology. It uses convection cooling to dissipate heat away from and around the CPU. The I.C.E.2 copper tubes, coated in nickel for enhanced tube hardness and rust-proof protection, are filled with distilled water to effectively channel heat and provide highly efficient processor and chassis cooling. The SH81R4 provides one PCI-E x16 and one PCI-E x1 slot to meet various needs of users. Select the card you want to use, such as multi-display graphic cards, surveillance cards, RAID cards, and professional sound cards, etc. The SH81R4 features one full size and one half-size Mini PCIe slots. This compact system supports mSATA SSD and WIFI modules, among other compatible modules. The SH81R4 provides HDMI video output to support 4K high resolution (3840x2160)*. Now with four times the resolution of Full HD, viewers can enjoy the super detailed and crystal clear imaging of 4K. *Intel® Pentium® and Celeron® processors built-in Intel® HD graphics cannot support 4K video playback capability. The SH81R4 features one HDMI and one DVI-I output to support dual-screen displays. Use an adaptor to convert HDMI into DVI interface and DVI-I into D-sub (VGA) interface for diversified signal selection. Shuttle XPC reserves space for installation of one 5.25” CD-ROM drive (ODD) and two 3.5” hard disks. With an optional PHD3 accessory users can install a maximum of four 2.5” hard drives (or SSDs). Use BIOS to set up the Wake-on-LAN function so that users can power-on from sleep mode, rest mode, or when powered off via the internet. Enter Bios to set-up Power On by RTC function can set system automatic power on. With Windows task scheduler, the system can power off automatically to achieve the goal of saving energy and operation cost. 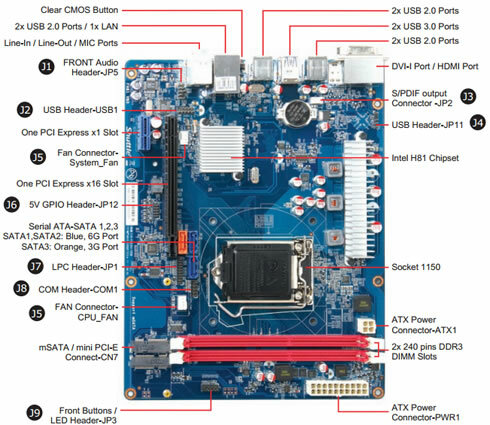 For various market demands, Shuttle expands its capabilities by adding support for Mini-ITX mainboards (17x17 cm or 6.7x6.7 inches). The Shuttle chassis goes beyond the Shuttle mainboard, so you can easily upgrade to the mainboard of your desire without any modifications to the chassis. Shuttle’s SH81R4 is equipped with an 80 Plus Bronze 300W power supply for guaranteed energy efficiency and energy saving. Shuttle’s 300W power supply cuts down on unnecessary power consumption for a higher level of energy saving. The front of this XPC is easily customized by simply changing the acrylic front plate. Add any design, such as a photo, graphic, or a company logo to the front panel. Shuttle has always placed great emphasis on the interior and exterior aesthetics of the XPC with the belief that a good blend of style and form factor allows the XPC to be attractive, versatile and work well in almost any environment. The Construction and cover of the R4 chassis is made on aluminium. This leads to a stylish, but robust appearance which has made the 4 a popular chassis design. The drives and media connectors on the front are easy to access in daily use.